The Book History Workshop, organised by the Institut d'histoire du livre, is the European offshoot of the Rare Book School, universally recognised by specialists in the field of book history. Founded by Terry Belanger at Columbia University, RBS is now run at the University of Virginia, Charlottesville. 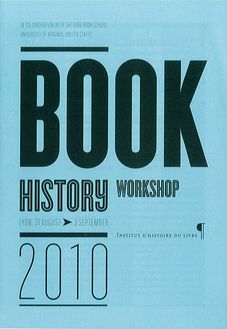 The Book History Workshop began in 2001 and is held each year in Lyon (France) in early September. The philosophy of the Book History Workshop is to perpetuate and develop skills and practical knowledge in the field of book history. Courses are based on intensive contact with internationally recognised specialists in specific fields, using printed and audiovisual documents with "hands-on" sessions with original documents of all periods from the rare book collections of Lyon's City Library, Archives and Printing Museum. An important aspect of the Book History Workshop is its transversality : by bringing together a wide range of professionnals it encourages exchanges among the many fields which contribute to the development of book history.